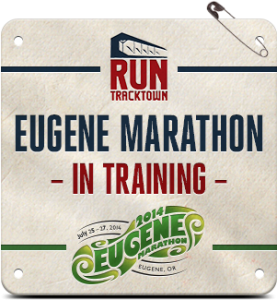 After 18 weeks of training, the Eugene Marathon arrived quickly. The months flew! I wasn’t sure I was ready for it, but I did all the training, in hot Sacramento weather, so I had to be ready at this point. 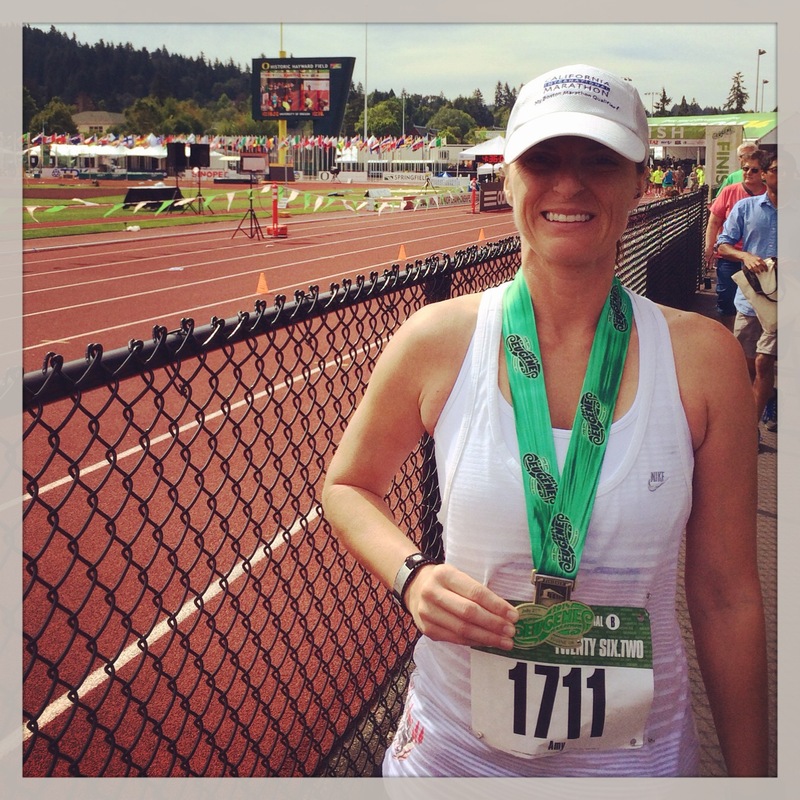 We arrived in Eugene the day before the race and went straight to the expo. After a 1.5 hour drive from Portland, we both needed to use the restroom so we quickly found parking and walked in. It was way too easy. Bathroom, bib number, then downstairs through the expo to get my participant shirt. 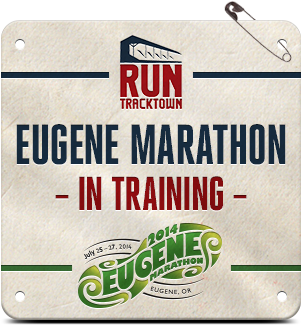 I also bought an official Eugene Marathon hat. It’s kind of my tradition – I always buy a hat from the marathon I run. We really didn’t spend much time at the expo because we wanted to explore Eugene. Since I was in Tracktown USA, I wanted to get in as much of the legendary track history as I could. 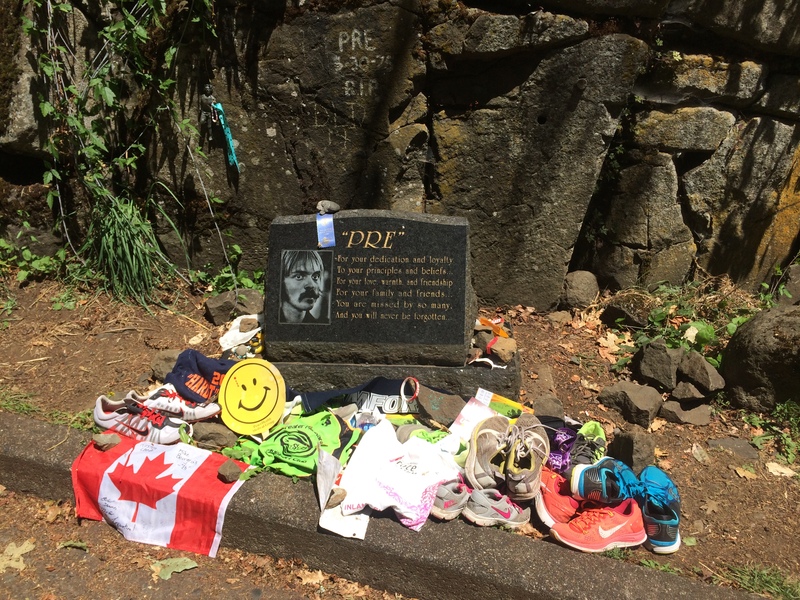 So after the expo, we roamed about town and then found Pre’s Rock, as in the famous track star, Steve Prefontaine. This tribute “rock” is at the site of where he crashed his car after leaving a party and ended up dying at age 24 in 1975. While driving around and stopping at other spots in Eugene (Ninkasi Brewing, Tacovore, Tap & Growler) I was also looking for pizza spots, as this is my favorite fuel for a marathon. I saw Tracktown Pizza directly across from the university campus and knew I wanted to go there! When we arrived it was pretty busy as there were a bunch of World Junior Track & Field Championship participants from the Netherlands and China also enjoying some delicious carbs. The menu was awesome and very fitting. You could pick from pizzas named “Decathlon” or “Track & Field Combo” or “Olympian” and various other track and field events. I loved it! So I got the “Olympian” hoping I would feel like a champ in the morning. I did the usual pre-race prep by laying out all my race gear, set my alarm for 4:35am, and then quickly went to bed. And 4:35am came quickly. I jumped up, got my clothes on, brushed my teeth and and made sure I had my bagel, banana, Vitalyte Tri-Phase Endurance fuel as well as my Shot Bloks and Chia Surge Energy Gels. 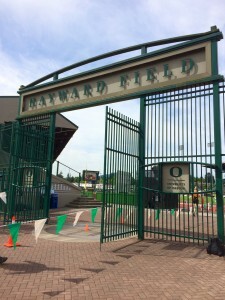 We were staying super close to Hayward Field so it was a quick 5 minute drive and we were there. I didn’t know how many people ran this race so when we arrived it seemed pretty quiet in the porta pottie line. I didn’t know if this was good or bad. But I was able to get into one immediately with no one waiting. Then about 20 minutes later more people showed up. But I still was able to get in line again with only like 2 people in front of me. I was supposed to be in Corral B, but as I walked forward to the front, I saw that the gate was open in Corral A, so I snuck in. The 3:35 pacer was right there, so I got in the group. After the National Anthem, we took off at 6am! I felt great! Just a couple miles in, I came upon a runner that I recognized by his gait. That may sound funny, but he kind of runs like a competitive run/walker. His name is Walter and was from Sacramento. I took my headphones out of one ear and said hello. He couldn’t believe I remembered him. I believe I first met him at the San Diego Marathon several years ago, but he was living in Sacramento at the time (now he’s living in Toronto), so I would then see him all the time after running around Midtown. I was glad I spotted him. I stuck with the 3:35 pacer for a long time…probably til about mile 10, but then I started to slow just a tiny bit. I could see the pacer not too far in front of me, but then I just started to drift away a little bit. I got a little mad at myself, but I had to just be okay with it. I was having a hard time mentally from like mile 10-12, but then just got in a zone after that. I just told myself that everything was fine. I’m still feeling fine. Nothing is hurting, nothing is feeling tight or sore, so just keep going. At that point I knew I wasn’t going to PR or BQ, but it’s OKAY! Just enjoy this. So I continued to run and tried to just enjoy what I was seeing along the course. Early on around mile 10 I had run over a bridge across the Willamette River and that was just gorgeous. From mile 17-25, I also ran along the North, West and South Banks of the Willamette River on a trail and that was nice too. For a long time, I felt like I was the last runner. No one was passing me. I never looked behind me but I just hoped I wasn’t last (I knew I wasn’t, but it was strange). I also passed a community garden around mile 17 that had huge sunflowers and I just loved it. Probably around mile 21 or 22, I started to see a few people that had also been in the 3:35 pace group slowing down and even walking. It actually kind of made me feel a little better that I wasn’t the only one slowing down. These few people were struggling way more than me. I had to walk for a few seconds at a time here and there, but I kept going. I saw a sign that said “When your feet start to hurt, run with your heart” and so I did. And right about that time, a guy ran by me and said “You’ve done this before! You can do it! There’s only a few more miles!” I don’t know how he knew I had done it before. It could have been my first one. But I loved his energy and it helped me! As I walked off the field, I grabbed a chocolate milk and pounded it. So good! Then I met up with Clint and we walked around for a bit after I changed into my flip flops. We decided to leave and go to breakfast (or maybe it was really brunch at that point). I was recapping the race to Clint and somehow the topic of the Timex Factory Team came up. I had submitted my application for their team about a month ago but hadn’t heard back. Then BAM! I checked my email while we were sitting there and there it was. I got the “congratulations” email that said I had been chosen for their team!! I was so excited I kind of teared up. I may have not met my original goal, but I wasn’t too hard on myself about it. I still had a decent finish time AND I received really great news about being on the Timex Factory Team. 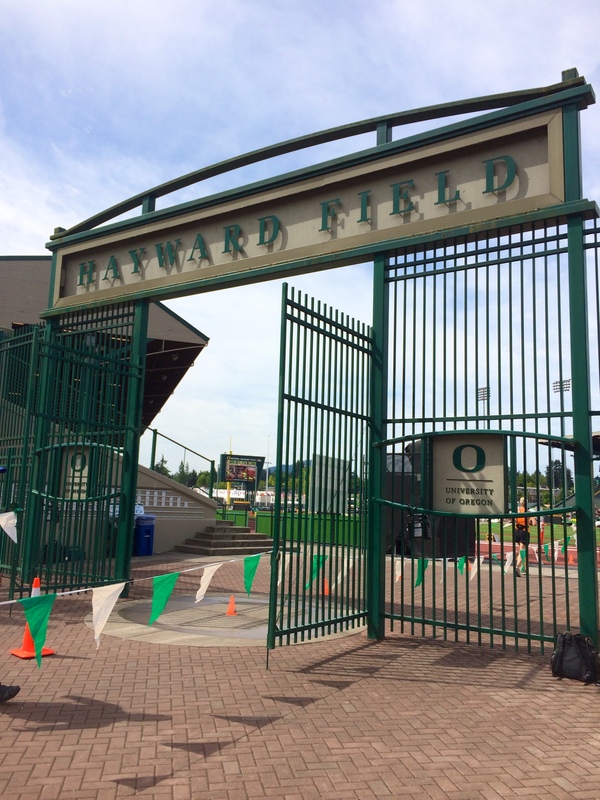 I also got to run on the historic Hayward Field and that was pretty cool too! It was a great day! !